Interviewed by The Real Dr. Doolittle! Home → News → The Latest → Interviewed by The Real Dr. Doolittle! There’s just nothing better than spending time chatting with another animal lover. I had the great fortune of being interviewed on The Real Dr. Doolittle Show with Val Heart…and what a wonderful time we had! 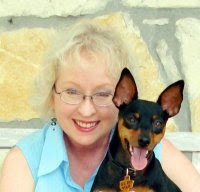 It was fun reminiscing about my journey as a writer, and remembering Martha, my special forever dog, who would inspire me to write For Every Dog An Angel. We shared stories…and a few tears…but that’s what often happens when animal lovers get together! So pour some tea, relax in a comfy chair and join Val and me as we talk about the joy of sharing our lives with our animal companions. Be sure to subscribe to The Real Dr. Doolittle Show with Val Heart, which is now available on iTunes.